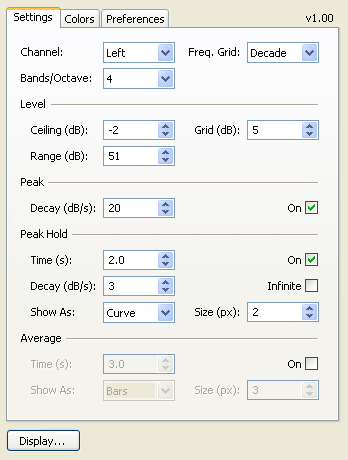 Spectrum Analyzer is a real-time spectrum analysis plug-in. The idea was to create an old-fashioned tool reminiscent of classic hardware analyzers of the antecedent century. Another unique (and quite experimental) feature of the plug-in is its detached spectrum display window, freely resizable independently of host application capabilities. Fixed: z-order of the 'mouse-over' readout. Fixed: 'Settings' window fonts on Win7/Vista. Fixed: 'Use presets to manage display appearance' option. Fixed: certain graphics issues with multiple plugin instances. Posted by Wilford Nusser on Thu, 09/24/2015 - 04:55.